In addition to elements of China’s missile force, the parade involved 12,000 troops, tanks, and scores of trucks and launchers carrying missiles, and appeared similar to past military reviews that were a feature of rule under the personality cult of Mao Zedong. President Xi Jinping was the centerpiece of the military display and was shown on television standing through the sunroof of a black car as he reviewed PLA troop and weapons formations that lined the main boulevard through Tiananmen Square. The square was the scene of the bloody June 1989 military crackdown when Chinese tanks and troops attacked unarmed protesters, ending a large-scale pro-democracy movement. During his review, Xi greeted sections of troops along the route and all replied in unison with a Communist Party slogan, "Absolutely follow the Party’s command; be able to win a war; develop an excellent moral character." Xi criticized Japan for trying to "enslave China" during the war. Beijing and Tokyo have been at odds over control of the Senkaku Islands in the East China Sea. China is claiming the islands, which are said to contain undersea oil and gas deposits, as its territory. Japan has owned the islands since the end of World War II. Rick Fisher, a military analyst with the International Assessment and Strategy Center, said China’s carefully scripted rollout of the DF-26 included an official disclosure during the parade that the intermediate-range missile is capable of attacking "medium-sized ships." "This makes the DF-26 a second generation anti-access weapon that extends PLA strike capability far into the second island chain," a string of islands hundreds of miles from China’s coast, Fisher said. "This is alarming because the United States has barely started to respond to China’s first-generation anti-access ensemble targeting the first island chain, like the DF-21D anti-ship ballistic missile," he added. The DF-21D also was displayed during the parade. It is considered a threat to U.S. aircraft carriers because the U.S. Navy has limited defenses against the high-speed maneuvering missile, which is accurate enough to strike a large ship at sea. Peter Cook, a Pentagon spokesman, said yesterday that defense officials are not surprised by the DF-21D. "It wouldn’t be the first time that new military hardware of some sort was displayed at a military parade, so I would suggest to you it’s not completely surprising and not something we wouldn’t have expected," he told reporters. He did not mention the DF-26 at the Pentagon news conference. Cook was asked why the United States does not hold similar military displays. "The U.S. military is the world’s foremost military, and people shouldn’t doubt that," he said. "And people know the strength of the United States, the strength of our military, and I think it’s safe to say that we don’t need to display it at parades necessarily for people to understand what the United States is capable of." U.S. military analysts closely monitored the parade and the weapons presented, a defense official said, adding there were no major surprises in weapons displayed. Both the DF-26 and the DF-21D missiles are part of what the Pentagon calls China’s anti-access area-denial weaponry and part of Beijing’s military doctrine that seeks to force the U.S. military, a fixture for peace and stability in Asia for decades, to move out of the region. As a result, the Pentagon has launched what has become known as the "pivot to Asia." However, critics say budget shortfalls have made the pivot less effective as a strategy to bolster allies and promote freedom of navigation in the region. A Chinese announcer during the parade called the DF-21D "an important weapon in China’s asymmetric warfare"—the Chinese military’s strategy of using niche, high-technology weapons that would allow a weaker force to defeat a stronger military. The CJ-10 long-range conventionally armed land-attack cruise missile also was on parade. It was described as a missile "capable of stealth penetration" that can inflict "palpable damage." It is one of China’s main battle armaments, the announcer said. In providing new details on the DF-26, a Chinese spokeswoman said the missile is capable of being launched with either or both nuclear and conventional armed warheads. "The DF-26 can conduct medium- to long-range precise attacks on key ground targets and large to medium naval ships," the spokeswoman said. "It is China’s new weapon in its strategic deterrence system." Fisher said the DF-26 appears to be a main reason behind Russia’s decision to violate the U.S.-Russia Intermediate-range Nuclear Forces (INF) treaty. "The DF-26 [Anti-Ship Ballistic Missile] ASBM indicates that China is winning the anti-access versus access arms race with the United States," he said. As for the INF treaty, the missile "severely undermines" the 1987 accord. "China’s deployment of new intermediate-range ballistic missile and medium-range ballistic missiles is a key reason why Russia has made repeated hints that it wants to end the INF Treaty," he said. The Chinese DF-26 deployment should prompt the U.S. government to realize that the INF treaty no longer contributes to U.S. national security, he said. "The United States needs to start building its own force of [Medium-Range Ballistic Missiles] MRBMs and [Intermediate-Range Ballistic Missiles] IRBMs to deter China and Russia," he said. 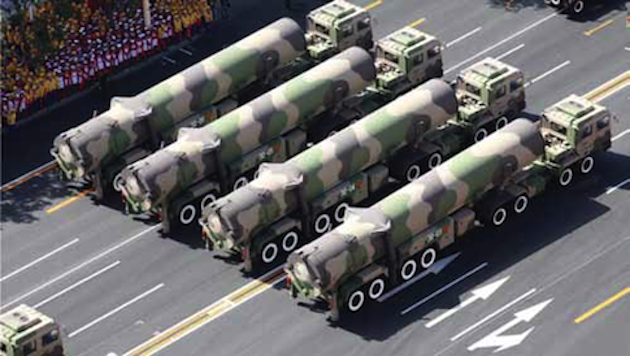 Short-range missiles in the parade included the DF-15B and DF-16, which Chinese state media said are used for conducting "precision strikes." One defense official said the parade did not produce any major surprises and was more significant for the four new high-technology weapons and capabilities that were not on display. "They didn’t show their cyber warfare capabilities, or their anti-satellite missiles, or the new DF-41 ICBM or the hypersonic glide vehicle," the official said. Those weapons are the ones that are believed to present the greatest challenges for U.S. war planners. The hypersonic glide vehicle initially identified as the Wu-14 is now being called the DF-ZF. 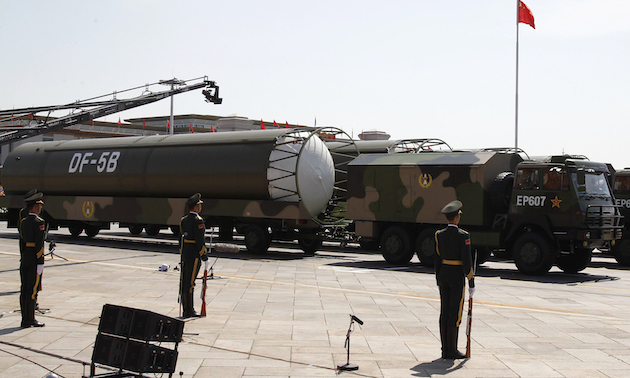 Other missiles shown in the parade included the DF-31A and DF-5B intercontinental ballistic missiles, considered the backbone of China’s expanding strategic nuclear forces. The DF-31A is a solid-fuel road-mobile missile that is an important strategic deterrent weapon for the Chinese. 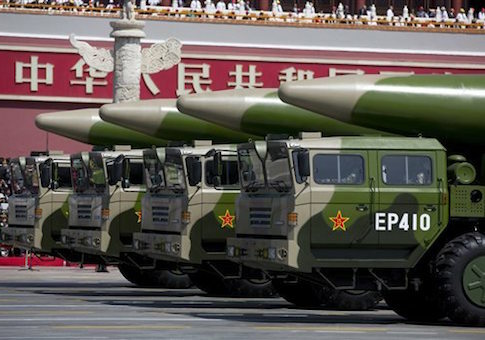 The DF-5B is a modernized variant of one of China’s longer-range missiles deployed in silos. "It is a shield of defense for national sovereignty, and national dignity," the Chinese spokeswoman said of the DF-5B. Mark Stokes, a former Pentagon China affairs policymaker, said the inclusion of advanced missiles such as the DF-26, DF-21D, DF-5B, and DF-16 "strongly suggests" the systems are operational. "Other systems, such as the DF-41 and hypersonic cruise vehicle, are likely in the advanced stages of research and development," said Stokes, with the Project 2049 Institute. "All are capabilities that have implications for the U.S., allies, and friends in the region." Fisher said the DF-5B has a multiple-warhead capacity that is based on technology obtained from U.S. satellite dispenser technology transferred to China in the 1990s for commercial satellite launches. The diversion of U.S. space technology by China for its missile and warhead programs was highlighted in a 2000 congressional investigation known as the Cox Commission, after its chairman Rep. Chris Cox (R. Calif.). The commission’s report warning of Chinese obtaining multiple-warhead technology has been confirmed, said Fisher, a former congressional staff member who worked for Cox. China’s DF-5B warhead "illustrates the dangers of cooperating with China in space, as it will exploit dual use technologies to threaten U.S. security," Fisher said. Asked about Xi’s announcement that China would cut 300,000 troops to streamline its forces, Cook, the Pentagon spokesman, said the announcement was not significant. "I don’t think we have a particular reaction to that news, other than it’s basically in line with what the Chinese have said in the past about the size of their military going forward," Cook said. UPDATE 4 September, 2015, 3:11 PM: An earlier version of this story described Rick Fisher as a former staff member of the commission chaired by Rep. Chris Cox (R. Calif.). He is a former staffer for Rep. Cox, but was not a member of the commission staff. This entry was posted in National Security and tagged China, Missile Defense. Bookmark the permalink.